There are many advantages to sodding compared to the alternative of seeding and strawing an area. Reasons for sodding vary but many times it’s the instant full and lush look that people are looking for the most. Aside from aesthetics, one of sodding’s biggest draws is the ability to control soil structure (prevent erosion) with a root system that is already established and an inch of topsoil. Some other advantages of sodding are its ability to control weeds, nice even coverage of ground, it can have traffic on it sooner, it’s made with better quality seed, and it can be installed almost year round. The main disadvantage to sod compared to other options is its high upfront cost of installation. But if done correctly it saves you money compared to seeding and strawing in the long run. Sodding your yard can be a great way to help keep your pets from bringing mud in to the house! 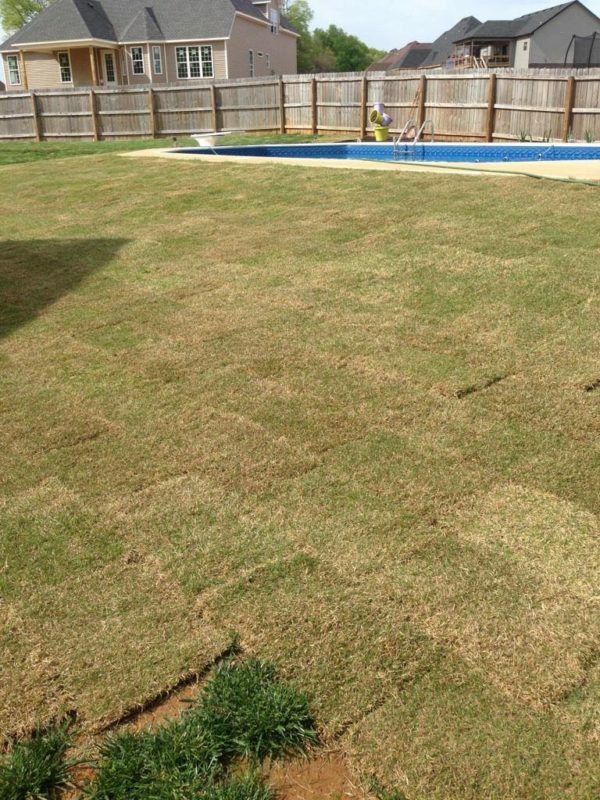 Give us a call today for a free estimate on the installation of your beautiful lawn. Before the work begins, we first take a look at the soil quality to see if there needs to be any top soil or sand added. We can do soil samples by request. This step is important to make sure the base for the sod is going to be at optimal conditions for root growth. The ground is then graded to ensure water is directed properly and to help prevent any erosion. Then, if need be, topsoil or sand is then laid out evenly and the final grade is put down. If topsoil is not needed, the ground is then tilled and cleared of any rocks or any other debris before laying the customers choice of sod. We offer fescue blends, Bermuda, and zoysia sods for installation and are happy to work with you to find out what might be best for you and your home or business today.